Quick Overview: Probably the best Mexican food in Old Town San Diego, their specialty is their carnitas (tender pork) and handmade tortillas. Tip: For the most authentic experience sit on the right side of the restaurant, the original seating with booths and colorful decorations. The left side was originally their patio seating, now converted into more dining area. It's sunnier but has less ambiance. 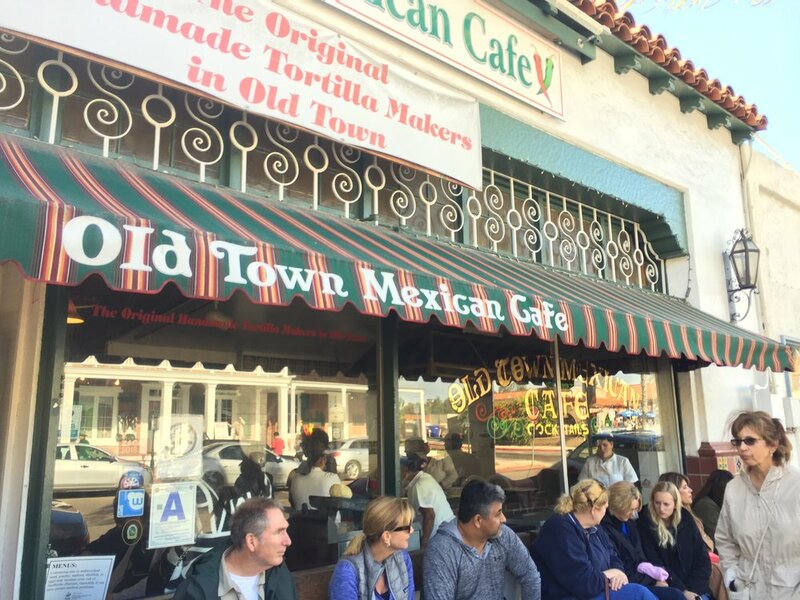 Buses drop off tourists, lines out the door, Food TV hosts gushing, but is the food at Old Town Mexican Cafe really any good? After all, it's located in San Diego Old Town, arguably one of the most touristy places in all of San Diego. I used to dine here all the time back when I first moved to San Diego to go to SDSU. Back then I was not a Mexican food expert by any means. Heck, I ate canned tamales and Taco Bell (disclaimer: I still would eat canned tamales if you put them in front of me). When I first started coming here you could get a heaping plate of carnitas, slow cooked pork served up with a plate of onions, cilantro, cups of roaring hot salsa, and a plate of handmade tortillas, for $5.50. I was poor, the food was great, life was good. Today that plate costs around $15. That's still a good price but was it as good as my memories? Well, perhaps. The beans were great and unlike some who knock off points for melted cheddar cheese instead of Mexican cheese I'm cool with that. Tasty, good. 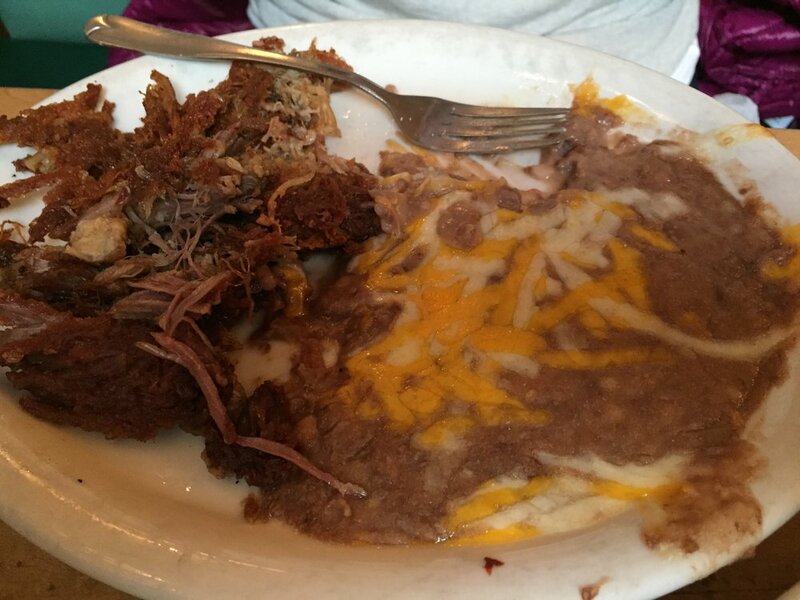 As for the carnitas you can order them cooked different ways, from deep fried chunks to pan fried crispy. I ordered crispy, a mistake as the meat was dry and no longer succulent but the crispy edges were tasty. I think the non-crispy version would be better, or the deep fried chunks. And yes, they have horrible plating by today's standards but this is how it has always looked and it's always been more about the food than the presentation here. You wrap the whole thing up in a handmade tortilla. Wait, let me tell you about these things. If you've only eaten supermarket tortillas get ready because these extra thick tortillas are the bomb, really delicious. Stuff them with meat and all the fillings and top with salsa and you are good to go. I forgot to tell you. When they bring you the chips (really great chips, by the way, and free with every meal which is cool) make sure you ask for the hotter hot sauce. The salsa on the left is the hot one and is really tasty. The salsa fresca on the right is good but not quite hot enough, so mix it up and go to town. You should also get a Margarita. House margaritas in most restaurants are not very good so upgrade to a Cadillac. I don't remember the price but it wasn't bad and the margarita surprisingly strong, I had two and regretted it later but enjoyed the ride nonetheless. I also ordered the Mexican Ribs, about the same price as the carnitas. I used to love these ribs, cooked on a rotisserie and spiced up with a delicious salty blend. Well, I knew I was in a bit of trouble when they brought out a side of BBQ sauce. And the ribs, while tender, had none of the great spices I was expecting but rather tasted like baby backs tossed on a gas grill. Meh. Don't get these, but the rice, yeah, the rice was really good. Wally Comments: I still like Old Town Mexican Cafe and would not hesitate to go back with friends from out of town. There's a nice ambiance here and the food authentic enough to please everyone. The portions are good, the tortillas and margaritas worth the wait. 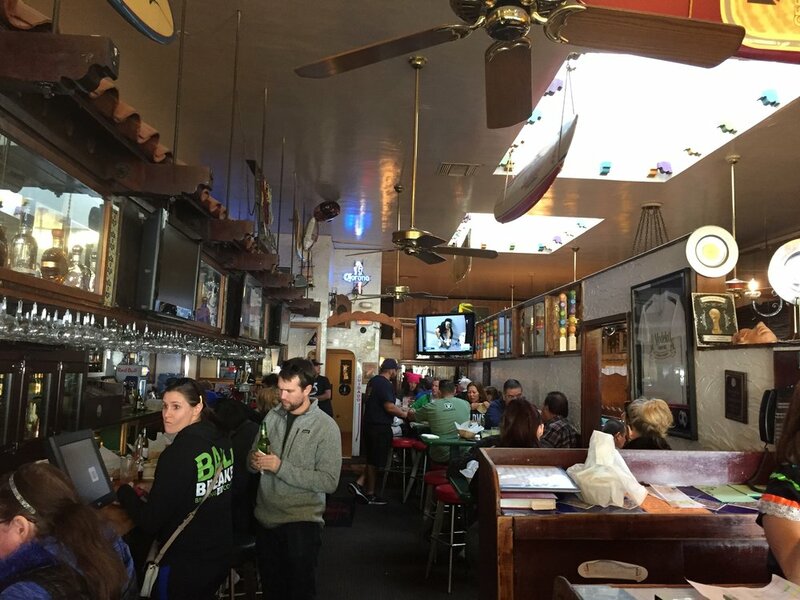 For locals I'm not sure I would wait in the long lines and instead just head up the hill to Ponce's or go to North County to Fidels or Tony's Jacal but overall Old Town Mexican Cafe is a solid pick for authentic Mexican food in San Diego.